The Ideas – Idea Generation Assistant app logs and links brainstorms, revelations, thoughts, and inspirations on your iPhone, iPad, and iPod Touch. The clean, solid functionality of Ideas makes it perfectly suited for the next Steve Jobs or Steve from next door. For iPhone 4S users, you can use Siri to enhance Ideas functionality. The Ideas iPhone app interface is simple and intuitive. You click the plus icon, and a text box and keyboard appear. You enter your idea, and click done. Untagged ideas remain in the unsorted list. You are not required to tag your idea, but you would be wise to do so. 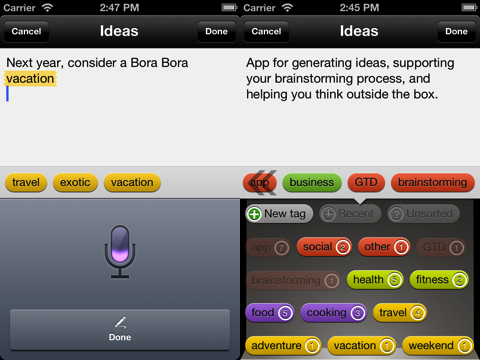 Ideas iPhone app performs at its best level with the tags. Tags are color-coded and grouped to help you link ideas together visually. The tag feature brings the generation assistant to life. You can quickly add a tag with a touch. The keyboard appears, and you enter it. Once you have created a tag, any future ideas with that tag will be automatically tagged. As you link seemingly disparate tags and ideas together, the Ideas iPhone app’s color coding helps you see the intersections. This color-coding is a visual stimulation that helps you expand your vision, or, perhaps, it will lead to refinement and focus. Once you have fully generated your ideas and you’re ready to tackle the details, you can export to Things or Omnifocus. You can convert your ideas into tasks and reminders. The simple, clean data entry for the Ideas iPhone app makes for a lovely transition to utilities applications. Ideas also fully integrates and updates all devices connected via iCloud. The simple functionality also makes the Ideas iPhone app a great to-do list option. Some of the to-do list iPhone apps are so highly complex that they don’t help you accomplish simple daily tasks. You can quickly jot down a few items, see them grouped together, and help you recall the one thing you need to complete the picture. 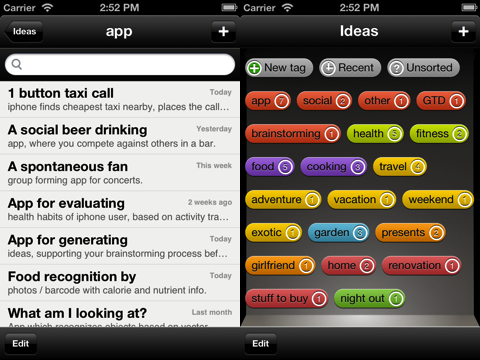 Ideas – Idea Generation Assistant’s color-coded tags bring visual order to your ideas. If you need to break them down to determine a course of action, Ideas helps you create results. If you are continuing to develop and think through an idea, Ideas helps you bring hopes and dreams to life. AppSafari review of Ideas – Idea generation assistant was written by Jenni Ward on March 22nd, 2012 and categorized under App Store, Notes, Productivity, Utilities. Page viewed 5983 times, 1 so far today. Need help on using these apps? Please read the Help Page. I have written quite a few articles about app idea generation (like this http://www.codenutz.com/10-techniques-generating-app-ideas/) and would like to cover some apps that can assist with it. Is this app available on android or any other device?